Located in a region synonymous with high altitude, the Everest Base Camp Trek is one of the highest trekking routes in the world. Typically starting at 2,600m at Lukla Airport and reaching a high point of just over 5,500m at Kala Patthar, the entire trek occurs in the two altitude regions aptly known as ‘high altitude’ and ‘very high altitude’. Along with these high-altitude zones comes the risk of altitude related sicknesses such as Acute Mountain Sickness, High Altitude Cerebral Oedema (HACE) and High Altitude Pulmonary Oedema (HAPE). Understanding the risks of these variants of altitude sickness, how to identify symptoms and how to deal with them is vital in ensuring your safety as well as the safety of others. 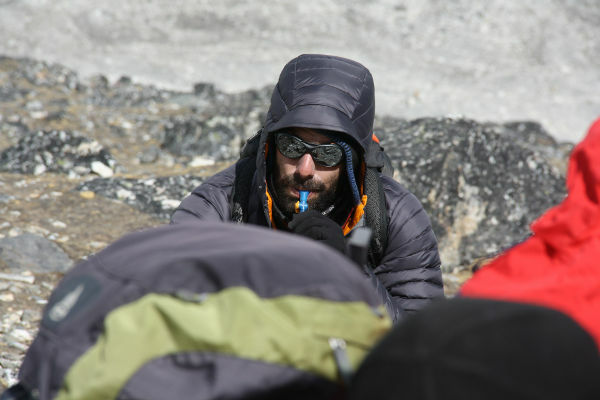 This article aims to bridge the information gap by providing a detailed introduction to acclimatisation, an outline of the major sicknesses and their conditions as well as provide some preventative tips and action that should be taken if altitude sickness is experienced. We also touch briefly on travel insurance and how it ties in with high-altitude trekking and the medical repercussions of this. Sources for this detailed guide include Rick Curtis’ Outdoor Action Guide to High Altitude, written for Princeton University. Disclaimer: The information provided on this page is to be used as a resource only and is not intended to replace any diagnostic or medical advice. It does not create any patient-doctor relationship and should not be used to substitute proper diagnosis by a physician. As information is constantly developing, it is up to you to ensure you seek the most recent information when visiting high altitudes. Acclimatisation refers to the process by which the body adapts to the conditions of high altitudes, such as lower levels of oxygen and decreasing air pressure. This is achieved by spending time at increasingly higher elevations, making the process gradual and often very frustrating for fast trekkers. As mentioned before, the Everest Base Camp Trek covers the two altitude zones of ‘high altitude’ between 2,500m and 3,500m and ‘very high altitude’ between 3,500m and 5,500m. Further zones do exist such as ‘extreme altitude’ and the grim sounding ‘death zone’ but these are only encountered much further up Everest than the base camp. Everyone reacts differently to different levels of altitude but most people will not experience any symptoms or feel any different when climbing from sea level to 2,400m. Past that altitude, you will typically start to experience symptoms due to the rapidly changing make-up of the air. As the Everest Base Camp Trek starts at an elevation of 2,600m, acclimatisation will play a role in the trek from day one. Without going into too much technical detail, a simple explanation of why the body experiences physiological changes at high altitudes will help you understand why the acclimatisation process is so important and why it cannot be rushed or skipped. At sea level, the air pressure sits at about 1atm (atmosphere) as a result of all the air molecules literally sitting on top of the air at such a low altitude. As you gradually move higher up, there will be fewer and fewer molecules of air exerting downward pressure, causing the air pressure to drop. What this means is that the spaces in-between molecules of air start to increase the higher you go up. As one of these molecules is oxygen, each breath of air we take will have fewer molecules of oxygen – this is what people refer to as ‘thin air’. Luckily, the body adapts to this unusual situation through four main changes. The first is that your breathing will become more rapid and deeper as your body aims to maintain the same oxygen intake per unit time. Secondly, your body will produce more red blood cells which are responsible for transporting oxygen around your body. Third, your lungs ability to absorb oxygen from the air will increase, and finally an enzyme is secreted that increases the effectiveness of the transfer of oxygen to your tissues. If you have been living in the Himalayas your whole life, like the native Sherpas, your body will be well accustomed to high altitudes, but for most of us the process of acclimatisation will take time. That is why gradual ascent is an essential part of the acclimatisation process – as annoying as it may be. Mountaineers use the term altitude line to describe the arbitrary height up to which each person will not experience any symptoms of altitude sickness. The basic principal of acclimatisation is to trek up to, but not exceed this line, and then allow your body to acclimatise to this higher but still safe altitude before progressing to your next altitude line. Let’s say your altitude line is 3,500m, so you ascend to 3,500m without experiencing any symptoms. You then rest at this altitude allowing your body to acclimatise. By the next day, your altitude line may now be 4,200m but you exceed that altitude and climb to 4,500m. You start to experience symptoms so you descend back to 4,200m where you are fine and you rest there for a night to let your body acclimatize. The only way to improve serious symptoms of altitude sickness is to descend immediately. Staying at the same altitude will typically resolve minor symptoms in a few days of rest but ascending after experiencing symptoms will only make the situation worse and will put your body in real danger. As everyone’s body will have different altitude lines, often uncorrelated to your age and fitness and based more on your genetic make-up, it is impossible to know beforehand what your line will be. Luckily, most tour operators factor in very conservative climbs in altitude and very generous rest periods that will ensure proper acclimatisation, meaning you don’t have to worry. That being said, it is still very important to understand the symptoms of altitude sickness so that a decision about possible descent or even evacuation can be made rapidly. Susceptibility to altitude sickness tends to arise at around 3,000m for most people although some may even experience symptoms from as low as 2,400m. The most common reason for people experiencing symptoms is through fast ascents in high altitudes. Generally speaking, ascending more than 500m a day from 2,400m and upwards increases the chance of altitude sickness. Over exertion and dehydration will further increase this chance which is why gradual ascent becomes even more important. Symptoms are grouped into mild, moderate and severe categories with the seriousness of symptoms increasing in each category. Deterioration in condition can rapidly lead to variants of altitude sickness such as HACE and HAPE, which pose much more serious and often life threatening risks. The transition from severe symptoms to HACE and HAPE is often very fast so it is important to be able to identify the mild and moderate symptoms so that this can be prevented. These symptoms are very common for most people as soon as they arrive in high latitude areas and can be resolved by allowing 1-2 days of rest for the body to acclimatise. From then you can climb to higher altitudes. Continuing to ascend with these conditions is dangerous and will only cause the onset of further symptoms. Descent is the only way to treat these symptoms and it should be done immediately. Once the symptoms have been resolved, gradual ascent can be started again. HACE and HAPE are closely related to severe symptoms of altitude sickness. Descent is compulsory under these conditions and further ascent is potentially fatal. This severe condition occurs when a pressure build up in the brain causes fluid to breach the capillary walls in the cranium. It is uncommon on the Everest Base Camp Trek and usually occurs in mountaineers at much higher altitudes, such as those encountered on an attempted summit of Everest. The symptoms of HACE are very similar to those detailed under severe altitude sickness such as bad headaches, coordination loss, hallucination and lapsing into and out of consciousness. There is a strong possibility of being comatose, so rapid descent has to be undertaken immediately. HACE often occurs at night, and most deaths occur while people sleep instead of descending immediately, night or day. Supplementary oxygen and dexamethasone can be given but should be done in addition to rapid descent. This condition that also only occurs at very high altitudes is caused by fluid breaching the pulmonary capillaries and entering the lung cavity. This has obvious implications on the ability to absorb oxygen into the blood. Symptoms include a tight chest, constant extreme shortness of breath, suffocation feeling (especially when sleeping), coughing up white/mucus coloured froth as well as fatigue, irrationality and hallucinations. Descent is the only option once again, but extra precaution should be made not to over exert the person suffering from HAPE as this can worsen the symptoms. Oxygen should be administered and the drug Nifedipine can help. If you have read up to here you have already covered most of what you need to know about acclimatisation, altitude sickness and its symptoms and treatments. Understanding the risks is essential to knowing how to prevent them. Below we have listed some rules that can be applied on the trek that should help you avoid any risks that could result in altitude sickness. Diamox is the most common preventative medicine taken to mitigate the symptoms of altitude sickness. It is by no means a cure as it aims to quicken the acclimatisation process and prevent the onset of symptoms. While you may not need a prescription to buy it in some countries, we recommend seeking medical advice before going taking it. In addition, it should not be taken by pregnant women or anyone with liver or kidney issues. A few of the side effects of Diamox are very similar to those of mild altitude sickness so we recommend taking a small dose while still at home to see how you react. This will allow you to differentiate Diamox side effects from altitude sickness symptoms. Because most people don’t suffer any side effects from Diamox, it can be used as an effective preventative measure when trekking to the Everest Base Camp. We still recommend consulting your doctor before deciding to take it. Most travel and trekking insurance only cover altitudes up to 2,000m, which is fine for most treks in most countries. For the Everest Base Camp Trek, you will need to get trekking insurance that covers you up to 6,000m. The insurance provider we recommend is World Nomads. They offer insurance up to 6000m hiking with a guide and include a Heli evacusation premium for treks in Nepal. Read our guide on Everest Base Camp Insurance for a detailed insight into what to look for when finding insurance for your trek. Is the trek suitable for my age?what special care should I take? Hi Atharva, being 14 years old and trekking to EBC is absolutely fine, what an amazing opportunity! This article can feel a little ominous, but the likelihood of something bad happening is very low. Make sure you follow best practice acclimatisation principles, going slowly, taking days to rest and acclimatise and drinking lots of fluids to stay hydrated. Hope you have a blast! Hi Mark.. I want to do ebc in the end of April.. N m living at sealevel..any precautions should I take?still I dont do my bookings with any trekking company..which one should be the best for ebc according to you? Your post is indeed a Wonderful read for first timer EBC trekkers. I would like to know any special care to be taken by a DIABETIC PERSON ABOUT 60 years old (who does very good training for long distance running since 8 years, though a fast walker and did 5 Half Marathons too) and takes insulin injection and DIABETIC MEDICINES too, but had an angioplasty done 2 years back and did good long distance walking on hills too and continues to do brisk physical fitness exercise as well. Hi Iyer, I recommend consulting a doctor to get the go ahead. The challenge on the EBC trek will be getting access to a varied diet – teahouses offer quite varied meals but certainly not as varied as you can get in a town. If you do get the go ahead from a doctor and find a tour operator that is willing to take you then I highly recommend having friend or family member with you who understands your condition and can administer your medication in case you are indisposed. Helicopter evacuation insurance would also be a good idea as quick access to medical services would necessitate helicopter evacuation. All the best! Hi there, wondering if the altitude medication is processed in the liver as we have Gilberts Disease in the family. My daughter is trecking at Base Camp- just started 2 days ago. She has had a reaction to the medication and collapsed. Went off the medication and feels better. They did 4 weeks of altitude training in the altitude tent before going. As a doctor what do you suggest she does? Hi Andrea, unfortunatley we are not doctors and this is an information-only site. I recommend consulting a doctor for advice, but if she is doing better without Diamox then it is probably best that she stops taking it. All the best. Hi Mark, thanks for great article. I got moderate altitude sickness at 8000 feet in Aspen. I got oxygen and symptoms did not improve until I left Aspen (2 day visit). I have suffered from Migraines my whole life. Given my strong reaction, should I reconsider not going to EBC? I am not sure how much medication can help. Hi Karin, it is very difficult to predict how your body will respond to altitude. All I can say is that EBC is significantly higher than Aspen, which means a really slow ascent to assist with acclimatisation is paramount. Medication like diamox can help with acclimatisation. The trek starts after flying into Lukla, which is over 9000 feet in altitude. So a rest day here before you start walking is a very good idea. Hope this helps! Hi Mark, great blog, very informative and helpful! We are used to trekking (we have trekked in the Canadian Rockies and in Norway) but we never did multi day itineraries, so I am a bit concerned about the effort and of course the altitude. I have been reading a lot and the acclimatisation process is clear, but I do have one question: in case one of us has mild or moderate symptoms, do tour operators usually have the flexibility to stay longer to give us the time to get better? We will go on a private tour, but the standard procedure is unclear to me. I read that there are cases of helicopter evacuations that aren’t really needed, because guides sometimes have commissions and for this reason push for evacuation when in fact descending a little could be enough… is it true? Have you heard of such cases? With the kids we obviously don’t want to take risks, but we don’t want to be flying in emergency if in fact is is not needed… how can we tell if we really need to ask for emergency evacuation? Hi Paula, thanks for getting in touch. Generally if you are on a private trek with a respectable guiding company, their guides will be able to adapt the itinerary slightly (within reason) to add an additional acclimatisation day or two into the trek. This is generally not the case on groups treks. I recommend contacting a guiding company to discuss your requirements. Under no circumstances should guides be calling helicopters unless it is an emergency. However, I can imagine that this sometimes happens with less than reputable companies. A heli vac should only be used when the person suffering from AMS can’t walk out themselves or because they are already at really high altitude (i.e. above 4000m) and getting low down quickly is not possible. Generally, if you take a EBC trek that is at least 12 days, with a few acclimatisation days, you guys should be absolutely fine. Hope this helps. Hi Mark, I am doing a solo travel to EBC in the month of September. Are there any specific things which I should keep in mind? Go slowly and plan in a few acclimatisation days. Thanks for a well laid out and informative site. My wife and I head out for our trek in a few days and your info will allow us to be a little more prepared. We’re carrying our own pack and have really tried to make it as light as possible. Did you find this difficult carrying your own pack and what did it weigh? I understand circumstances can affect people differently. We are moderately fit, well with the exception of my small beer gut. Hah! Thanks again.